We’d love your help. Let us know what’s wrong with this preview of Teaching a Stone to Talk by Annie Dillard. To ask other readers questions about Teaching a Stone to Talk, please sign up. Reading Dillard is like watching a figure skater. You don't really understand or appreciate what you've just experienced until you try to walk across an icy sidewalk. Wholly unexpected and completely amazing. I see the reviews of my fellow Goodreaders and I can echo them, Dillard is an artist and her words both perplexed and thrilled me (the polar expedition histories interspersed with detailed observations about the eclectic praise band at her church - finally meshing together with a trippy baby christening on an arctic ice flow??) WOW. She made me laugh out loud. It is madness to wear a ladies straw hat and velvet hats to church - we should all be wearing crash helmets. Ushers should issue life preservers and signal flares and lash us to our pews for the sleeping god may wake someday and take offense, or the waking god may draw us out to where we can never return. We are here on the planet only once and might as well get a feel for the place. We might as well get a feel for the fringes and hollows in which life is lived. And she encouraged me to read everything she has written. Thank goodness she has a large canon. This woman is amazing. More Dillard! Annie Dillard is one of the most satisfying essayists I know. Although I am not, generally, a reader of nature studies, Dillard's essays seem just perfect to me. If I had a single criticism, it would be that she generally ties in a theme or moral to her story to the extent that it would almost seems forced , but the language is so beautifully descriptive and the resolutions so elegant, that I am willing to forgive her for it. In "Total Eclipse" she manages to describe the experience of witnessing Annie Dillard is one of the most satisfying essayists I know. Although I am not, generally, a reader of nature studies, Dillard's essays seem just perfect to me. If I had a single criticism, it would be that she generally ties in a theme or moral to her story to the extent that it would almost seems forced , but the language is so beautifully descriptive and the resolutions so elegant, that I am willing to forgive her for it. In "Total Eclipse" she manages to describe the experience of witnessing a total solar eclipse in ways that are otherworldly and profoundly beautiful (and even slightly terrifying). Nothing has made me want to experience a solar eclipse myself more than Dillard's essay. In the title essay, she begins by describing "...a man in his thirties who lives alone with a stone he is trying to teach to talk." From this, the essay expands eventually into a commentary on cosmology and theology and the palos santos trees on the Galapagos Islands, and yet it all seems to be a natural evolution. This is the way with all of her essays. From "Total Eclipse": "The mind—the culture—has two little tools, grammar and lexicon: a decorated sand bucket and a matching shovel." From "An Expedition to the Pole": "It all seems a pit at first, for I have overcome a fiercely anti-Catholic upbringing in order to attend Mass simply and solely to escape Protestant guitars. Why am I here? Who gave these nice Catholics guitars? Why are they not mumbling in Latin and performing superstitious rituals?" From "Living Like Weasels": "Our eyes locked, and someone threw away the key....It felled the forest, moved the fields, and drained the pond; the world dismantled and tumbled into that black hole of eyes." Not my favorite, though there are wonderful moments here. She seems in "An Expedition to the Pole" to get wrong what she gets so right in For the Time Being. In the latter, she lays her examinations--internal and external--side-by-side and leaves us to connect. They resonate against one another and flare out into unexpected meanings. Here, she smashes her examinations of the lives of arctic explorers together with her impressions of a largely mundane Catholic service in a surreal mish-mash that Not my favorite, though there are wonderful moments here. She seems in "An Expedition to the Pole" to get wrong what she gets so right in For the Time Being. In the latter, she lays her examinations--internal and external--side-by-side and leaves us to connect. They resonate against one another and flare out into unexpected meanings. Here, she smashes her examinations of the lives of arctic explorers together with her impressions of a largely mundane Catholic service in a surreal mish-mash that clumsily does the work she will later allow her readers to do themselves. Still and all, she stuns with her sentences ("Nature's silence is its one remark, and every flake of world is a chip off that old mute and immutable block" for example) and provides the kind of metaphors that clatter around in the brain for days or months or years--the dessicated dead weasel's skull still clamped on the neck of an eagle for the tenacious life, the hide-draped cow skeleton trapped hip-deep in a sinkhole for the side-tracked life. We don’t know where we belong, but in times of sorrow it doesn’t seem to be here, here with these silly pansies and witless mountains, here with sponges and hard-eyed birds. In times of sorrow the innocence of the other creatures—from whom and with whom we evolved—seems a mockery. Their ways are not our ways. We seem set among them as among lifelike props for a tragedy—or a broad lampoon—on a thrust rock stage. Found this one somewhere. In the past I have found AD to be a bit of a trial. The Maytrees was unreadable but her memoir wasn't too bad. The BIG problem for me is her intensely twee/poetic prose. This book is a collection of shorter pieces. I read the first one last night and it was ... OK. I'll be reading one at a time. "Chapter " 2("An Expedition to the Pole") Meanders for many pages between the author's experiences as a spiritual seeker in a local Catholic church(definitely NOT a cathedral) an Found this one somewhere. In the past I have found AD to be a bit of a trial. The Maytrees was unreadable but her memoir wasn't too bad. The BIG problem for me is her intensely twee/poetic prose. This book is a collection of shorter pieces. I read the first one last night and it was ... OK. I'll be reading one at a time. "In the Jungle" - a short piece set in Ecuador. AD must have take a nature tour there. Sounds nice. So ... it's no good hoping that the next story will NOT be over-written and NOT airy-fairy. Best to relax, accept and enjoy the good stuff. "The Deer at Providencia" - Still in Ecuador and contemplating the unsolvable - suffering and death. Good stuff. In. Africa I watched a cow being butchered for a feast of which I partook. After its throat was cut you hear it trying to breathe. In the words of David Helfcott, "It's a mystery." "On a Hill Far Away" - a tinker creek "story." Is Ms. Dillard still a Jesus-squeezer? (no - she dumped Catholicism a while ago, after having become an adult convert) A la Mary Carr/Karr(?) ... Emotionally wobbly ... married three times. "Total Eclipse" - while AD's description of the physical manifestations of totality are piercingly acute and wondrous, she goes predictably bat-bleep nutty with all the "spiritual/emotional" stuff she attaches to the experience. She gets a bit biblical too ... ick! "Lenses" - microscopes and telescopes. "Life on the Rocks: The Galapagos - I liked this one. Ms. Dillard continues to veer from fairly straightforward to out-of-control and I prefer the former. "A Field of Silence" = back to airy-fairy land with the somewhat incoherent(to me) and flaky-prosed Ms. Dillard. More of her religiosity and other related craziness. God ... angels ... One is reminded of Faulkner. That man has a LOT to answer for! "God in the Doorway" - Poor Annie = uber-sensitive girl. Miss White was crazy - no need to apologize! Where's the good sense? Once again I'm reminded of the guy in the Alaskan bush in the school bus = "Into the Wild" another personality in extremis. Last night's two readings were good examples of the up-and-down nature of this book for me. "Mirages" had some interesting descriptive language, but overall the verbal/spiritual fireworks were just ... too ... much. The next bit, "Sojourner," an essay about mangroves, was much better(for me). The book is uneven. More often than not, I don’t know what is being said or why. Words and sentences are presented with little or no meaning. Stories jump around and I miss their line. And yet, there’s always enough to keep me going. When Dillard encountered a weasel unexpectedly, she writes that “our eyes locked, and someone threw away the key.” It’s “face was fierce, small and pointed as a lizard’s; he would have made a good arrowhead,” she observes. Reflecting on its life, she says that “The The book is uneven. More often than not, I don’t know what is being said or why. Words and sentences are presented with little or no meaning. Stories jump around and I miss their line. Or, Dillard taps into a nice image of mystery. Walking by a field, she remarked to her friend that “’There are angels in those fields.’ Angels!...I have rarely been so surprised at something I’ve said. Angels! What are angels? I had never thought of angels, in any way at all.” Thinking about it a bit, she writes, “My impression now of those fields is of thousands of spirits – spirits trapped, perhaps, by my refusal to call them more fully, or by the paralysis of my own spirit at that time – thousands of spirits, angels in fact, almost discernible to the eye, and whirling. If pressed I would say they were three or four feet from the ground.” That’s enough for most people to keep their distance. Dillard senses and shows what most of us do not see. And that’s a good thing. In this collection of fourteen essays Dillard brings her almost forensic observation of natural world as well as a keen perception of the smallest detail to a wide variety of subjects. Starting with her thoughts on a solar eclipse that she travels to see in Yakima, we accompany her on her a journey to the Appalachian Mountains and all the way to the Galapagos Islands. With her we see the world through the eyes of a weasel and take a walk from her home. We also meet the man who inspired the title In this collection of fourteen essays Dillard brings her almost forensic observation of natural world as well as a keen perception of the smallest detail to a wide variety of subjects. Starting with her thoughts on a solar eclipse that she travels to see in Yakima, we accompany her on her a journey to the Appalachian Mountains and all the way to the Galapagos Islands. With her we see the world through the eyes of a weasel and take a walk from her home. We also meet the man who inspired the title of the book, who is Teaching a stone to speak; most will think this a futile gesture, but as Dillard explains, it is his way of communing with the natural world at the pace he desires. The silence is all there is. It is the alpha and the omega. This was not my favorite of Dillard's books, which is similar to saying a certain Renoir painting is not my favorite - the opinion is supplied by subjective lenses and in no way denies the mastery of the artwork. And no one masters the art of prose quite like Dillard. My favorite segments of this collection were God in the Doorway, Aces and Eights, On a Hill Far Away, and Sojourner. But all are beautifully written and worth the reading. “I alternate between thinking of the planet as home–dear and This was not my favorite of Dillard's books, which is similar to saying a certain Renoir painting is not my favorite - the opinion is supplied by subjective lenses and in no way denies the mastery of the artwork. And no one masters the art of prose quite like Dillard. God does not demand that we give up our personal dignity, that we throw in our lot with random people, that we lose ourselves and turn from all that is not him. God needs nothing, asks nothing, and demands nothing, like the stars. It is a life with God which demands these things. Experiences has taught the race that if knowledge of God is the end, then these habits of life are not the means but the condition in which the means operates. You do not have to do these things; not at all. God does not, I regret to report, give a hoot. You do not have to do these things--unless you want to know God. They work on you, not on him. The eighteenth-century Hasidic Jews had more sense, and more belief. One Hasidic slaughterer, whose work required invoking the Lord, bade a tearful farewell to his wife and children every morning before he set out for the slaughterhouse. He felt, every morning, that he would never see any of them again. For every day, as he himself stood with his knife in his hand, the words of his prayer carried him into danger. After he called on God, God might notice and destroy him before he had time to utter the rest, "Have mercy." Adventurous collection of essays, generally on the intersection of God, humans, and nature. I could wish the whole book more unified, and more descriptively personal (like An American Childhood) than spiritually/emotionally so. But she writes so musically well that I enjoy every piece, no matter how strange or discordant the tune. Favorites: "The Deer at Providencia" and "On a Hill Far Away." Amazing short stories, heart achingly beautiful renderings of fleeting moments within the natural world. Her stories are written both with clarity and an impressionistic aura. Treat yourself to the story Total Eclipse to see what I am unable to capably put into words. When I remember that books are primarily for our entertainment and edification, I come down hard on this book. It didn't do much of either for me. Beautifully written and it bored the hell out me. No one ever succeeds in teaching a stone to talk, but if Dillard could teach me how to write even half as well as she does, I think that'd be about the same thing. I gave up reading after 1/3 of the way through. Too random for me. I wanted to like this more than l did. I think I'll try another book by Annie Dillard, because I have heard such good things of her. Maybe I was just reading this at the wrong time. Like all of Dillard’s non-fiction, this fairly short book of essays is overflowing with strange word combinations and unique reflections, rife with gorgeously vivid descriptions, and filled with insights that give one regular moments of pause. Having added this one to my collection some years ago, recently another author’s (Eugene Peterson's) brief reference to a particular essay, “An Expedition to the Pole,” led me to comb through my boxes of un-shelved books in search of this collection. The t Like all of Dillard’s non-fiction, this fairly short book of essays is overflowing with strange word combinations and unique reflections, rife with gorgeously vivid descriptions, and filled with insights that give one regular moments of pause. Having added this one to my collection some years ago, recently another author’s (Eugene Peterson's) brief reference to a particular essay, “An Expedition to the Pole,” led me to comb through my boxes of un-shelved books in search of this collection. The timing turned out to be serendipitous. Upon viewing the Table of Contents, I discovered the first essay, the one right before “An Expedition to the Pole,” was titled “Total Eclipse.” By some odd chance, a total eclipse had just occurred in my area of the Midwest US about a week earlier. Of course I began with this first essay, which was excellent, before continuing on to “An Expedition,” and thus I committed to reading the entire book. Some of these essays are quite short, seeming to be simply a brief thought or interesting observation expanded upon, and others would be good choices to search out online for those not interested in committing to the entire book. Of these, the first two that I’ve specifically mentioned remain my favorites, but one of the other longer ones, “Life on the Rocks: the Galapagos,” fits this category as well. The final essay, “Aces and Eights,” is also one of the more lengthy ones and is an interesting reflection on aging and our relative experience with the passage of time. Some travel as tourists. Annie Dillard roams the earth an explorer. 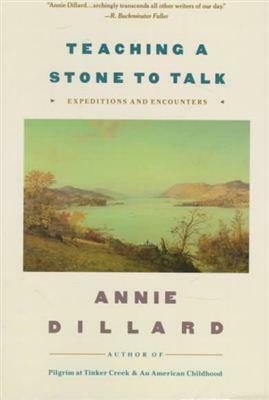 In Teaching A Stone to Talk she invites the reader into her expeditions and encounters with creatures, both human and animal, but also inanimate ones, like stones. From Puget Sound to the Galapagos Island, the author uses microscope, telescope and polarized sunglasses to examine her world. I learned something about an expedition to the South Pole through her eyes, a deer caught in more than headlights and a man named Larry who, i Some travel as tourists. Annie Dillard roams the earth an explorer. In Teaching A Stone to Talk she invites the reader into her expeditions and encounters with creatures, both human and animal, but also inanimate ones, like stones. From Puget Sound to the Galapagos Island, the author uses microscope, telescope and polarized sunglasses to examine her world. I learned something about an expedition to the South Pole through her eyes, a deer caught in more than headlights and a man named Larry who, in his own way, teaches a stone to talk. Nu blir det Dillardpaus p.g.a. naturskildringsoverload efter tre D på kort tid. "You know what it's like to open up a cottage. You barge in with your box of groceries and your duffelbag full of books. You drop them on a counter and rush to the far window to look out [...] Opening up a summer cottage is like being born this way: at the moment you enter, you have all the time you are ever going to have." Reading other reviews of Annie Dillard was more enjoyable than reading her book. She never taught that stone to talk. I am still trying to comprehend what either of them were trying to say. I do feel I need to apologize because i too love to write. I enjoy beautiful phrases that evokes human emotion but at some point the reader must leave fulfilled. Ask my husband, and he says the same of my attempts at writing my thoughts. I have stopped letting him read my pieces. Annie Dillard is one of my favorite authors and I have enjoyed reading and re-reading her books ever since I discovered and loved Pilgrim at Tinker Creek fifteen years ago. She captures the natural world in all its everyday glory and mystery and makes you want to walk in the woods and listen to the wind or maybe travel to the arctic and walk on the ice. Stories worth telling, and worth reading. Annie Dillard (born April 30, 1945) is an American author, best known for her narrative prose in both fiction and non-fiction. She has published works of poetry, essays, prose, and literary criticism, as well as two novels and one memoir. Her 1974 work Pilgrim at Tinker Creek won the 1975 Pulitzer Prize for General Nonfiction. Dillard taught for 21 years in the English department of Wesleyan Unive Annie Dillard (born April 30, 1945) is an American author, best known for her narrative prose in both fiction and non-fiction. She has published works of poetry, essays, prose, and literary criticism, as well as two novels and one memoir. Her 1974 work Pilgrim at Tinker Creek won the 1975 Pulitzer Prize for General Nonfiction. Dillard taught for 21 years in the English department of Wesleyan University, in Middletown, Connecticut.